Spin-Off Research is a subscription-based independent research service focused on evaluating Spin-Off situations. Our goal is to provide as much accurate, in-depth information as possible to our clients ensuring they make an informed investment decision. The research is presented in our publication, Spin-Off Research, a monthly advisory report, featuring continuous research on public Spin-Offs. Reports include detailed analysis on fresh and recently announced Spin-Offs, a global Spin-Off calendar, and company updates. An annual subscription includes our monthly publication, Spin-Off Research, and supplemented throughout the month with our timely Email Bulletins. The initial coverage report will provide Deal Overview, Detail Rationale, Investment Thesis, Valuation and Recommendation, Business Overview, Historic Financials, Financial Outlook, SOTP Analysis, Industry Overview, Current Financial Statements and Management Analysis. Coverage starts from spinoff announcement with continuous coverage through event date, and up to nine months after event date. Published every month, the calendars will track and monitor in chronological order up and coming Spin-Offs detailing information on parent company, spinoff entity, associated tickers, share ratios and important future dates. 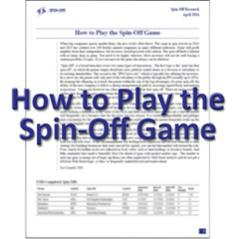 Spin-Off Research will track and analyze Spin-Offs from announcement to Spin-Off, through to three quarters after (covering the Spin-Off entity). Thus, we fully cover the Spin-Off for all major news and results, adjusting our valuations and releasing updated forecasts if necessary. Coverage starts from spinoff announcement with continuous coverage through event data, and up to nine months after event date. No analysis is done on potential spinoffs. As soon as there is announced Spin-Off information, Spin-Off Research will send out an email detailing any information that is relevant including dates, share ratios etc. In addition, periodic emails containing any relevant information on past, current or future Spin-Offs will be sent out.